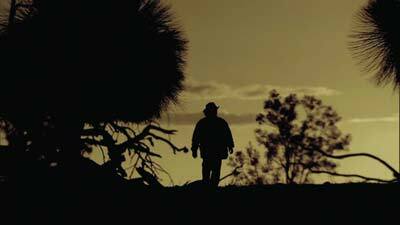 Spirit Stones is both a contemporary and historically stylised, one-hour documentary of Nyoongar elders giving their account of mysterious stones that fell on Aboriginal (Noongar) camps in rural Western Australia. In the 1940s and 1950s, stone 'showers' delivered stones in locations up to 250 kilometres apart, falling at various places across south-west WA for hours, sometimes days and even weeks and months. The Spirit Stones came through roofs, tents, walls and tables without leaving holes. Sometimes warm or hot, spirit stones travelled in peculiar directions. Even today there is no single explanation for this mysterious phenomenon. Spirit Stones uses first person voices to detail these uncanny events. As a documentary about Fortean events Spirit Stones is filmed with a gentle, poetic calm, offering a glimpse into both the portraiture of Nyoongar elders and into a phenomena that remains unexplained until today. Mysterious things happen in Allan Collins' film Spirit Stones. Spirit Stones fell in Mayanup, Pumphreys Bridge, Borden and Boddington in Western Australia. Aden Eades believes that the old spirits got angry and wanted to do something about the destruction of the land through clearing which happened at that time. Spirit Stones features unusual and beautiful photography. In the book The Mystery of the Mayanup Poltergeist Helen Hack reports her research into the event at Mayanup. If you're interested in researching, look also for 'stones' and 'poltergeist'.